Step right up to see impressive iPad and iPhone tips and tricks! Learn stunts like annotating photos without an app, compelling Siri to flip a coin, conjuring up keywords on a page, hearing highlighted text, making clutter on web pages vanish, closing all Safari tabs in the blink of an eye…the magic at your fingertips seems limitless. So many secrets are unleashed below! I use the Zoom Controller as a screen pointer. You know when you mirror your iPad or iPhone screen through an adapter or through AirPlay to a big screen? Or when you screen record? Your audience cannot see your fingers. With the Zoom Controller on, you can move the round icon around the screen and you have yourself a pointer that floats above every app and Home screen! When not in use, simply drag the Zoom Controller to the side of the screen. You can turn on Zoom in the Accessibility settings. Apple has hidden some characters on the iOS keyboard. For example, tapping and holding the Zero key reveals the degree symbol. Sliding up and releasing on that symbol enters it as a typed character. Want to type a bullet? Hold down the hyphen key and slide up to the • symbol and release. How about a cents sign? Hold down the $ key and you’ll see the ¢ symbol (along with symbols for other currencies). Holding down certain letters reveal that letter with a variety of accents. And, if you’re entering a web address, holding down the period is a quick way to type .us, .org, .edu, .com, or .net. There’s a new feature added to iPad’s onscreen keyboard in iOS 11. The keyboard now has a gray character above each letter. For example, there’s a gray 5 above the letter T key. To type a 5, simply flick down on the T. Or, to type an @ symbol, flick down on the A key. This a little faster than tapping the “. ?123” key to switch to the number/symbol keyboard and then selecting the 5 or the @ symbol. The gray character do add clutter to the keyboard. You can turn them off in Settings → General → Keyboards and turn off Enable Key Flicks. If your Apple device is running iOS 12 or later, you can switch from entering text to moving the cursor by long pressing the spacebar. The keyboard will become blank to indicate that it is in trackpad mode. Drag your finger around the keyboard area to move the cursor. Lift your finger from the screen to return to keyboard mode. While in trackpad mode, you can tap the keyboard area with a second finger to begin selecting text. Move your finger to expand the selection. iPad users can select a sentence or line of text by double tapping anywhere on the keyboard with two fingers. Double-tapping with three fingers selects the entire paragraph. When using an iPhone or iPad, you don’t want to stop what you are doing to rate an app. And you certainly don’t want students to be distracted by any unnecessary popups. Yes, it’s quick to dismiss the “Please rate our app” dialog boxes, but it would be nice to just never ever see them. Good news! With iOS 11, you can disable app rating and review popups! You can find the option to turn them off in the iTunes & App Store section in the Settings app. Please, though, if you like an app, please take the time to rate and review it in the App Store. I would mean a lot to the developer. With iOS 11 we can record an iPad or iPhone's screen without using a computer! 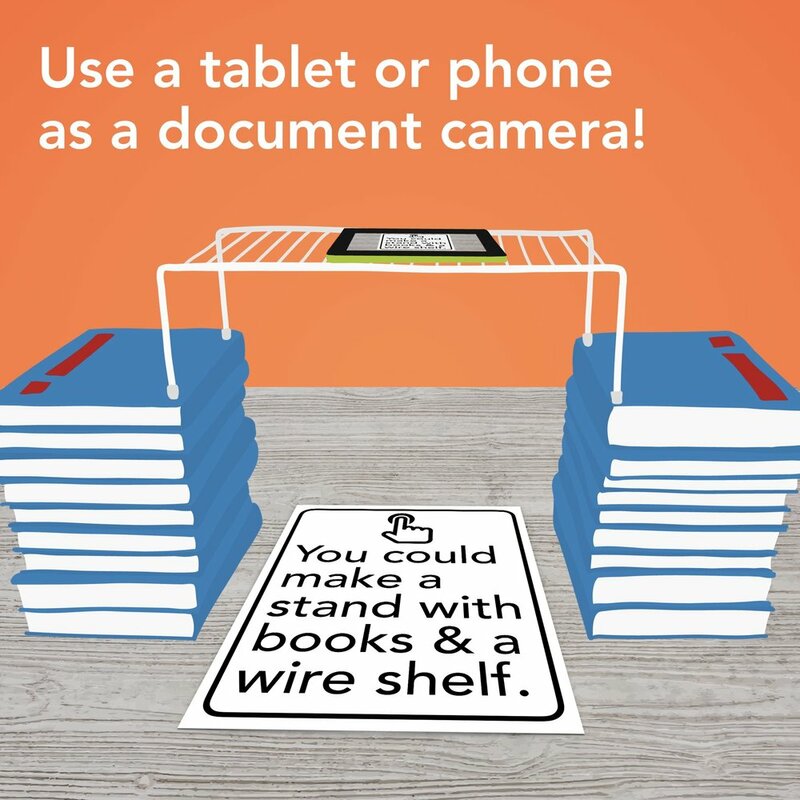 Screen recording with narration is handy for producing how-to videos and app demonstrations. It’s also great for students to record think-alouds as they use an app or series of apps. Apple has made screen recording in iOS 11 fairly simple, however, you do need to add the Screen Recording to your device’s Control Center. You do that in the Setting app under Control Center. After it’s added, you simply swipe up from the button of the screen to open iOS 11’s Control Center. You’ll see a button with a white circle. When you press the button, a countdown appears before recording begins. However, it might not be set to record your audio. Ensure microphone audio is on by tapping and holding the record button in Control Center until you see the Microphone Audio button. If audio is off, tap the button to turn it on. Then tap Start Recording. Press the Home button and open any app. When done recording, simply tap the red bar across the top of the screen. The recording stops and a video is saved in Photos. From there you can share the video to other apps like Google Drive, Seesaw, YouTube, or iMovie. You can trim your screen recording in the Photos app. While viewing the saved video, tap Edit. You’ll see a timeline along the bottom of the screen. Tap and drag the starting and ending arrows to trim the video to just the segment you want to keep. The trimmed video will be saved as a new clip, and you can delete the original, untrimmed version. It can take some time to arrange an iPad or iPhone Home screens. We used to be limited to moving each app icon individually. With iOS 11, we can select and move multiple apps at a time. To stack icons, long press one icon until it jiggles. Drag that icon somewhere and hold it there (near the bottom of the screen works well). With another finger, tap each additional icon you wish to add to the stack. Adding to the stack is easiest if you use a finger on your other hand. You can move this stack to other Home screens by dragging it to the left or right edge of the screen. You can tap to add more icons to the stack, or release the stack to dump the icons onto that particular Home screen. You can also release the stack onto a folder to place them in there. You can markup a image with the Photos app in iOS 11. While viewing the image, tap Edit, tap More (the three dots), and tap Markup. You will see tools along the bottom for adding drawings, highlights, shapes, magnifiers, and text. Apple’s Markup editor provides 6 color choices, three line thicknesses, and three fonts choices. Shapes, arrows, and magnifiers can be adjusted by dragging blue and green dots. Tap and hold any markup item for Duplicate and Delete options. The highlighter tool is awesome! Students can take photos of a page in a book and then highlight the text. Or, students can highlight text in screenshots. Tapping Done saves the image with the markups. It’s good to know that you can always go back and revert to the original photo, removing any annotations. You don’t need to install a QR code reader app with iOS 11. With iOS 11, the Camera app on iPhone and iPad automatically detects QR codes. When a code is in view of the camera, a notification appears at the top of the screen. Note that the Camera app must be in Photo mode in order to detect QR codes. The notification tells you the kind of QR code (website, text, email, text, phone, calendar, Wi-Fi). If you tap the notification on a website QR code, the URL will open in Safari. Don’t have iOS 11? I recommend i-nigma. It’s free for iOS and Android. It works great and is simple. I like that it keeps a history of the last 50 QR scanned. With iOS 11 you can scan documents with the Notes app. In a new or existing note, tap the + and choose Scan Document. The camera opens, looking for a rectangular shape. The detected shape is highlighted in yellow. Press the white circle to snap a photo, and then you can adjust the corners of the document before keeping the scan. You can then add more pages to your scan or tap Save. The saved scan is cropped, sharpened, and straighten to make it look like you put it through a flatbed scanner. I like that the document does not have to be perfectly lined up with the camera because scanning works at an angle. It’s simple to send your scan as a PDF to email, Google Drive, Seesaw, Explain Everything, Dropbox, etc. Tap the scanned image in the note and tap the Share button. Yes, you can type on the scanned PDF. After saving the scan in Notes, click the Share button and choose Markup. Tap the + to add text boxes. You charge Apple Pencil by taking off the cap and sticking the exposed Lightning connector into iPad Pro. It’s kind of awkward to have the Pencil sticking way out, but at least it charges really quickly (within minutes). I am worried I’ll lose the cap while charging. Luckily, there’s a place to stick it on my iPad so that it doesn’t roll away. Apple has placed magnets in iPad's frame! The newest version of Keynote for iOS, which is free, includes drawing tools. You can use these tools to make a cartoon version of a photo by tracing! 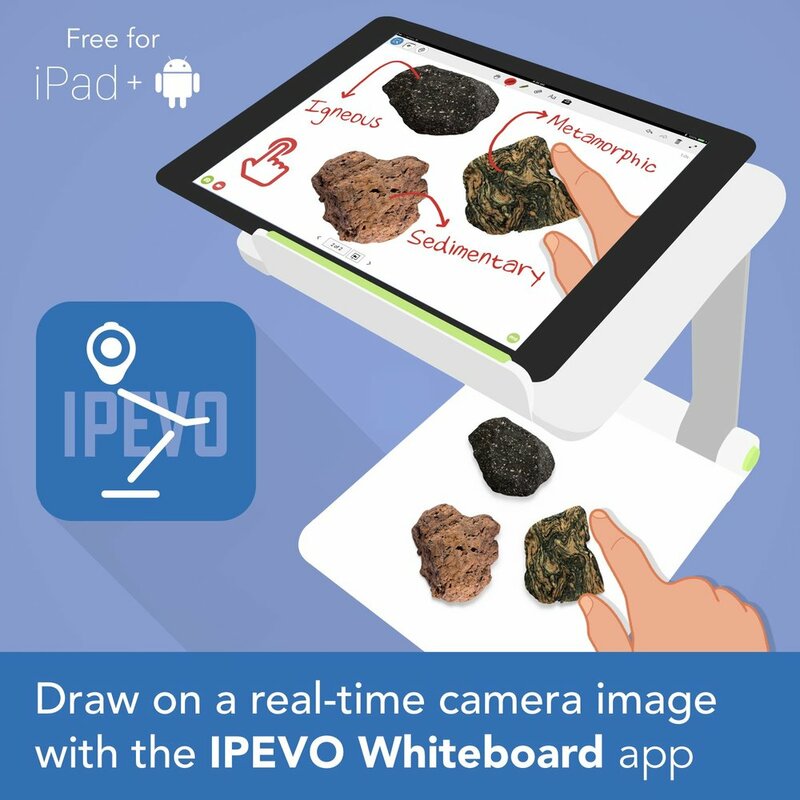 You can trace with a finger, stylus, or Apple Pencil. Using drawings in your presentations and graphics can give them a friendly and unique look. You can simplify by excluding the photo’s background. And with a drawing, you can change colors and other details–your traced drawing doesn’t have to exactly match the photo you’re tracing. For example, you can trace a map and add your own color coding. Hint: Stretch your fingers to zoom into the slide before drawing. It will be easier to draw when the image is as large as possible. There are times when you don’t want to stop recording video, and yet you want to take a photo. With an iPhone, you can do both! While the Camera app is recording video, simply click the white circle on the screen. The center of the circle will blink, indicating that a photo has been saved to your Photo Library. Note that Photos taken while recording video are wide screen instead of the usual 4:3 standard aspect ratio for photos. You can crop if needed. Photos taken while recording video are of a lower quality than those taken when you are not also recording video. Taking a screenshot after a video is saved is an alternative to snapping a photo while filming. Play the video and pause at just the right spot. Make sure to tap the screen to hide the buttons and controls before snapping the screenshot. Rather than skimming and scanning your way through a long web page to see if a keyword appears, use the Find option. On a desktop, it’s easy to call up the Find on Page box with a Command/Control + F keyboard shortcut. On iPads and iPhones, the Find on Page button is found in the list of options you see after clicking the Share button. You will probably have to scroll past options like Copy, Print, and Add to Favorites before you see Find on Page. Alternatively, you can enter your search term in the address bar. Scroll down in the suggestions box and you'll see results for Find on Page. An iPhone, iPad, or iPod touch can be set up to display a Speak button when text is selected. First, you must enable Speak Selection by opening the Settings app. Choose General → Accessibility → Speech and turn on Speak Selection. Also turn on Highlight Content so that each word is underlined or colored as it is spoken. With Speak Screen enabled, anytime you select text in apps like Notes, Mail, Safari, and Google Docs, a Speak button will appear. Tap that Speak button to hear the text read out loud as it is highlighted. An iPhone, iPad, or iPod touch can be set up to read the content on the screen. First, you must enable Speak Screen by opening the Settings app. Choose General → Accessibility → Speech and turn on Speak Screen. Also turn on Highlight Content so that each word is underlined or colored as it is spoken. With Speak Screen enabled, swipe down with two fingers from the top of the screen to have the screen read out loud to you. This works in most apps. The speech menu hovers above your screen while iOS reads the screen. Use this menu to increase or decrease the speed. You can also use it to skip ahead to other sections of the page. Click the X on the menu to stop the speaking. If the content scrolls down multiple screens, Speak Screen will continue reading to the bottom of the page. You can use the free Pages app as a teleprompter! Apple has added Presenter Mode to the Pages 4.0 iOS app. Presenter Mode automatically scrolls text, and you can set the speed at which the text moves up the screen. The ability to present text in a teleprompter is handy for when recording videos. You could record video with one device and use a second one for Presenter Mode. It’s better to select a slower auto scroll speed so that you have time to pause between thoughts. If too fast, you will be frantically trying to read the words before they scroll off the screen. Got several Safari tabs open on your iPhone or iPad? Want them all closed? Instead of tapping each tab’s tiny X button, there is a way you can close all tabs at once. Simply press and hold the Tabs button, which is the icon with two overlapping squares. Then tap the option to close all tabs. Ta-dah! The maximum number of open Safari tabs in iOS 9 was 36. In iOS 10 and above, the number of tabs is said to be unlimited. However, I’ve seen posts by people who have hit a limit of 500 Safari tabs. Imagine closing 500 tabs individually. Yuck! If you’ve scrolled down a long web page on your iPad or iPhone, you can quickly jump back to the top of the page by tapping the status bar. The status bar is the small strip of icons along the top of the screen that includes the time, WiFi signal, and battery level. This handy tip works in many other apps as well. Webpages and blog posts are often littered with advertisements, menus, and other extraneous information. Apple’s Safari browser can strip away the clutter to present a streamlined version of the content, making the page easier to read. It’s called Reader View. If it’s available for the page you are viewing, you’ll see the Reader View icon to the left of the web address. Simply tap and the content is instantly made more readable. In fact, you can tap the formatting icon (the AA) to the right of the web address to change the font, font size, and page color. Long press the Reader View icon to set a specific website or have all websites automatically show in Reader View. Viewing two Safari windows side-by-side is my new favorite iOS 10 feature for iPad! Here are four ways to enable Split View… ① Tap and hold the Tabs button and choose Open Split View. ② Tap and hold a link and select Open in Split View. ③ Drag a tab to either side of the screen. ④ Use the shortcut Command + N on an external keyboard. Being able to see two web pages at once is great for research, comparing prices, and completing forms. With Safari Split View enabled, you can drag tabs from one side to the other. In fact, you end split view by dragging all tabs from one side to the other. Another way to end Split View is to close all tabs open on one side. Siri has a lot of tricks up her digital sleeve. One of them I happened upon is that she can spell for me. As a person with a spelling deficiency, this is incredibly helpful! It's also helpful in classrooms because the teacher doesn't have to be the one to always answer the persistent question, "How do you spell ___.?" Siri can help you choose students, randomize math problems, and settle who goes first. Siri can tell you the results of flipping a coin, choosing a card from a deck of cards, and rolling dice. You can also ask Siri to pick a random number within a defined range. For example, “Hey Siri, random number between 1 and 25.” If each of your students is assigned a number, this is a easy way to randomly choose someone. The free Post-it Plus iOS app is pretty amazing. You simply point your camera at a set of square papers. Post-it Plus detects each note. Notes are cropped, sharpened, enhanced, straightened, and placed onto a digital whiteboard. You can move and rotate the notes on that whiteboard. It’s handy that you can make and label groups and move notes between them. You can tap a note to bring it up in a full screen view. While in this view, you can click Edit to add drawings or typed text to the note. With the Editor’s Pack (an in-app purchase) you can change note colors and use the eraser. You can export and share the whiteboard with notes as a PDF, Powerpoint, or set of images. Also, you can share the board as a .3CSB file, which can be opened in Post-it Plus on other devices. I just love that sticky notes no longer have to be stuck in one location because they can be made available anywhere, thanks to Post-it Plus. You've got some choices when it comes to screen mirroring your iPad or iPhone. Read more. 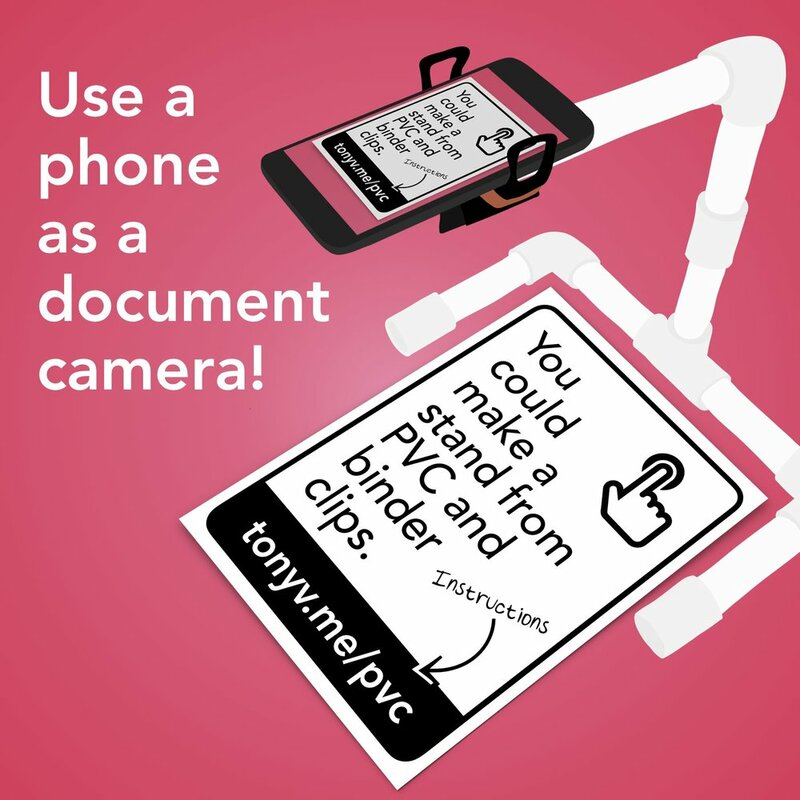 If you're mirroring your iPad or iPhone, you might want to use it as a document camera. You can buy a stand or make your own. Read more.